Airtel, the name we were proud of, is now a name we don't want to listen. There are many reasons why Airtel is losing their creditably. Till now Airtel is known as most expensive telecom network and during the past few years the hike in price was tremendous. I know most of the people were using Airtel SIM just for incoming calls, but since last few years, their network connectivity becomes worst. Many times I complain about the low network coverage. Few times Airtel Network Engineers came to my house and never gave any solution except to say we are forwarding this issue to higher authorities. I remember, during Common wealth games the call drop issue was very high. I raised many complaints and got reply that there is a big building in front of your house and that was a false reason. When I said I am going to port my number, they said we are giving you 150Rs Good Will Waiver. So, first charge extra for bad service and if a customer asks for the good service they will start giving lots of reasons and at last just a waiver. What about those customers, who don't know how to raise complaints or those who don't have time? No offer for them? Few hours back, Airtel has announced new tariff packs which are just repacked and misleading offers. Here I will explain, how these packs are always repacked and misleading ones. But one good thing Airtel is doing and that is making customers educated about the reading terms and conditions before thinking that this one is for free. Remember guys, there is nothing free in this world. Here I am giving you some clarification and evidences about fake Airtel's offers. How they are making customers fool by setting up baits. Again guys, super educated Airtel marketing team is giving "FREE" International Roaming Calls at just 699Rs for 1 day. If I am paying 699Rs then what is free? well, I don't have many words for Airtel as they are solely giving competition to Reliance Jio by means of Words. This new free, oops, not free International roaming plans are just available in 4 countries. Just 4 countries guys. The main focus it to tell you that the same old International Roaming packs are now relaunched with the word "FREE". To do a simple comparison just check screenshots below. First one is old and Second one is new. You can clearly see that prices are now close to double because of a "FREE" word, While the benefits are still same. Once the Airtel customer returns to India, the benefits of the plan ceases and the customer is automatically reverted to the base plan opted for prior to the Offer. There is no guarantee of network coverage in the country you are traveling. Monthly rental of Rs. 149 (IR Service) will be applicable with the Rs. 999/599/799/4999 International Roaming (IR) pack. There are lots of terms and conditions attached with this pack which you need to read once before selecting this one. If you are an old Airtel customer then you already know that there are lots of Airtel to Airtel offers since 2011. Har Ek Friend Zaroori Hota Hai campaign was first started in 2011 and since 2011 the company has launched many tariff under this campaign. But now they are again launching same offer by highlighting "FREE". The Advertisement looks like they are giving all Airtel calls for free, but in actuality nothing is free. The Free Calls are Free only if you buy a tariff, so in general it's not free. They are relaunching Har Ek Friend Jaroori Hota ha but only Airtel To Airtel calls will be free under this offer. Why not other calls are free? Reliance Jio is providing Free calls for Lifetime and you can't provide free calls after charging money. 3. Old Plan that was not Free but Airtel called them free. Now just read below article and you will find that Airtel repacked old International Pack with Free word. This Article is enough to prove that Airtel call packs as free while they are charging at the same time. It's like charging you money and then saying take it, it's free of cost. Guys, the best way to know what customers are thinking about a company is by checking customer responses. I am giving you one TVC link, just watch it and then read all comments. You will see how much customers are angry after watching Airtel's misleading TVC. In the entire video, there is no mention that you need to buy a pack for this free Airtel call. First of all, let's compare Rs 149 plan. With Airtel, only Airtel to Airtel calls are free While in Jio Every call is free. With Airtel, Roaming is not free, while with Jio, there are No roaming charges. With Airtel, Enjoy 50Mb data for 30 days, while with Jio its 300+700Mb. With Airtel No free video Calls, while with Jio, video calls too are free. So it's clear that Airtel's 149 Rs plan is truly wastage of your money. While there is No need to pay 349Rs to Airtel when you can get Everything for Free with Jio till 31st March. Note: For Reliance Jio, Free is Free. Everybody is enjoying Free Jio Services. Why Both Idea and Airtel have same plans? isn't mean that both companies are united to rob us? As much I know the company's Plans are always secret so two different companies with same plan can't be Coincident. 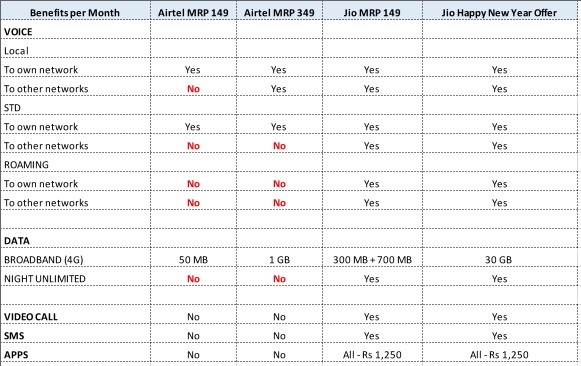 The only conclusion is, if you do not want to get fooled by Airtel's Free offers then migrate to Reliance Jio where customer satisfaction is always on the priority and Free means 100% Free. Watch the latest happy new year offer from Jio here!